Alyssa (Ally) Skindingsrurde, a recent graduate of Whitewater High School, is the featured artist for the month of August sponsored by the Walworth County Arts Council. The display is located in the lobby of the Government Center on the square in Elkhorn. Skindingsrude was the 2013 recipient of a $1000 art scholarship from the Arts Council. Her work was judged “highly creative and original” and “demonstrates a confidence in using various materials and techniques.” In the fall Skindingsrude will continue her education at UW-Milwaukee as an art major. Her interests are in graphic design, interior design, and fashion. 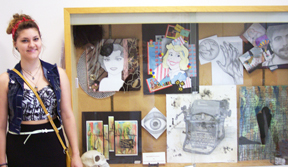 The artist attributes her high school success in art to her art instructor Debbie Brigham-Schmuhl. It is not necessary to be a member of the Arts Council to have art work presented in the display case. Walworth County artists interested in having their work presented should contact Arts Council volunteers Al Gruling at (262) 642-5281 or Dale Hagan at (4140 837-4363.